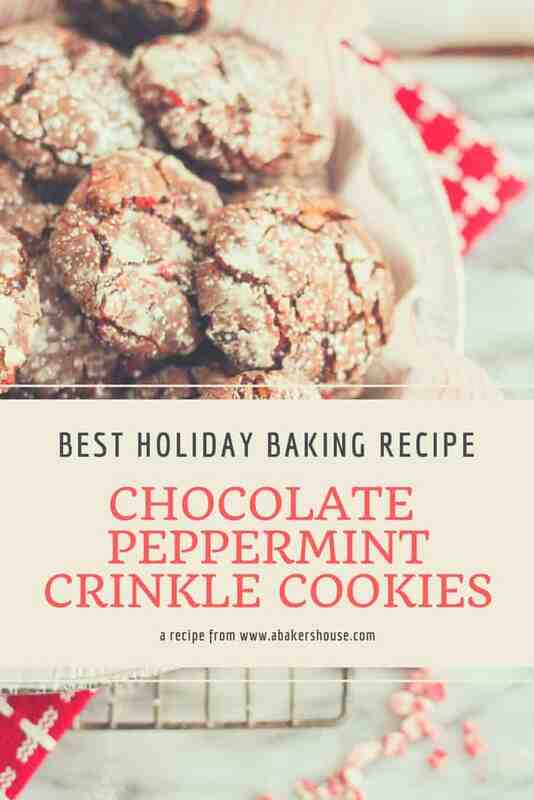 Chocolate peppermint crinkle cookies should be on your holiday baking list of goodies. They bring together the flavors of the season– chocolate with soft peppermint bits that melt in your mouth. 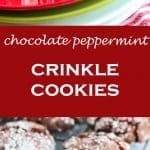 Santa might request these chocolate peppermint cookies as his goodnight snack on Christmas Eve or at least that is what I am telling my boys! Crinkle cookies are easy to bake and make a big impact with their festive sprinkling of powdered sugar. Let it snow! Coffee crinkle cookies are right up there on my long list of favorite cookies too. 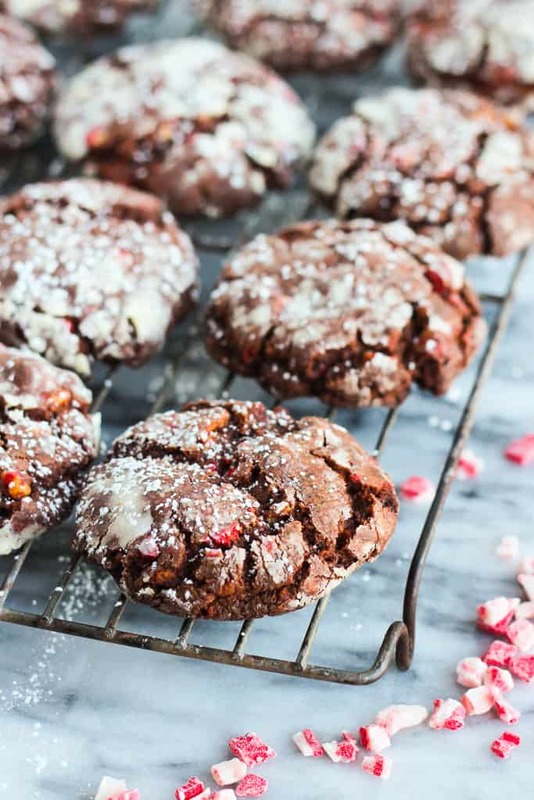 Melted chocolate adds to the deep flavor of these chocolate peppermint crinkle cookies. This cookie is perfect for holiday baking and belongs on any list of the best holiday cookies! Peppermint chips are a seasonal item at the grocery store. Or buy these Andes Peppermint Crunch Chips here online. 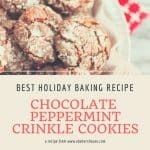 How do I make crinkle cookies? Prepare the cookie dough: beat the sugar, butter, add the eggs. Add the melted chocolate. Fold in the dry ingredients. Mix in the peppermint chips. Make small balls of dough and roll in confectioners’ sugar. Bake and sprinkle with more confectioners’ sugar after baking if needed. So make these cookies with your family or make a batch for a holiday cookie exchange. The recipe doubles easily and the finished cookie dusted with powdered sugar makes a festive treat inside a cookie tin too. I originally made these chocolate peppermint crinkle cookies in 2013 for a cookie with the #CreativeCookieExchange and have updated the recipe and photos for this 2017 season. My cookies were shared at a church potluck. 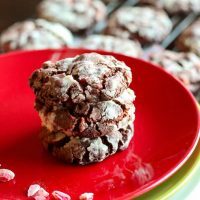 Festive and bright, these chocolate peppermint crinkle cookies are easy to share with a crowd and they travel well. Print the recipe to have ready to share. Can I store cookies in a tin? If you are storing these cookies in a cookie tin it’s nice to place each one in a cupcake baking cup to keep the cookies from moving all over the place while you transport them. Last year I used Pringles containers to store, gift and ship my cookies. Brownie Cookies and rugelach are more tasty options for cookies that travel well. How do you like to wrap homemade gifts? Try these 12 Cookies to Bake this Season for more ideas. These fun winter snowmen cookies make great holiday cookies too. These chocolate peppermint crinkle cookies are festive and holiday-party ready. Combine the flour, baking powder, cocoa powder and salt. Whisk gently to blend. Set aside. Melt the chocolate chips in the microwave. Let cool slightly. Beat the butter and sugar until fluffy. Add the eggs one at a time. Add the melted chocolate and mix until well blended. Fold in the flour mixture and the peppermint chips. Cool the dough in the refrigerator for 1-2 hours. Overnight is ok too. Preheat the oven to 350 degrees F. Prepare pans with parchment paper. Make small balls with the cookie dough. Roll in the confectioners' sugar. Place on the prepared baking pans and bake for 10-12 minutes. Let cool on the pan for about 5 minutes then cool completely on wire racks. Dust with more confectioners sugar if needed. 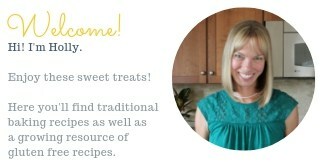 Join me on Pinterest and save this pin for later! 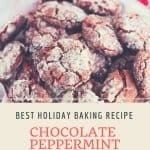 Do you need more peppermint cookie recipes? Here is what the #CreativeCookieExchange made– what gorgeous cookies! Use us as a great resource for cookie recipes–be sure to check out our Facebook page, our Pinterest Board, and our monthly posts. Find them the first Tuesday after the 15th of each month! What a timely post for me. As I type I have a dozen cinnamon roll cookies in the oven. These look amazing. Oh I bet your kitchen smells so good today! What a great idea to stack cookies in muffin cups, Holly. You are so smart! And those cookies look wonderful! I am loving the peppermint theme this month – so many great cookies, and these are no exception. I think I may have a package of those Andes Peppermint Crunch Baking Chips in my pantry, so I’ll have to search for them so I can try these. I love your idea about the Pringles container, what great way to ship cookies and keep them protected. Thanks for visiting my blog, Felice. I hope you find those chips in your pantry. I cleaned mine out the other day and was surprised by what I found! Why didn’t I know about these Andes peppermint chips?????? They sound wonderful! I need to get some. Your cookies are so gorgeous and I love the packaging. I only found them recently and think I’d better stock up before they disappear from the shelves! they are softer, more like white chocolate chips rather than hard, candy canes. Love them! The peppermint crunch do indeed make your cookies sparkle, Holly. What a yummy sounding cookie. You gain weight but have great breath 😉 My kinda cookie! And that pringle can idea — GENIUS!!! And did you change the look of your blog? LOVE it! Thanks, Yvette! I did switch to WordPress so I am learning a lot this week! I didn’t do the transfer myself but now am hoping to spend some time learning about WordPress so I can customize and update a few things. It’s a work in progress but I am excited so far! I hope your Christmas preparations are coming along well. Not much longer to go! The cookies look great. Where is the recipe? Thanks, Shelley, the recipe didn’t appear for some reason– thanks for your comment. I’ve updated it and can see it on my end. Hope you can too! I love these cookies Holly. Zoe would devour them as chocolate and mint are favorites of hers. Hope we can finally manage getting together in the new year! By the way I am loving your IG posts! Have a Merry Christmas! Thanks, Abbe! I found some Andies Mint chips too that I plan to use sometime soon. Yes, lets get together in January!